When we decide for a themed wedding, we are aiming to set the tone for the whole series of events, from decorating the reception hall to the finest detail as a wedding ring pillow. Combination of classic white with navy blue is easy on the eyes and gives plenty of opportunities to express your creativity with accessories. It's up to you how far will you go. You can choose seafood for your wedding party or opt only for embroidered life preservers on the napkins. But in any case everything will start with invitations. All right, with save the dates, actually, but the part with invites is the one where things become really serious. If not before, you have to choose a theme by then and from then on you have to stick with it. 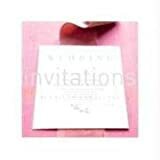 Sending nautical wedding invitations can be great start into magical experience of the biggest day in your life. There are so many emotions involved, you simply can't pay attention to every single detail, but with few general guidelines and enough time for preparation, everything should be running smoothly and every minor disturbance will be likely solved without a hassle. 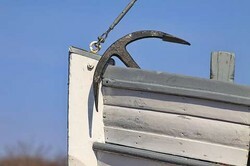 Most popular nautical themes always involve anchors, knots, sailing boats, compasses and similar elements with strong symbolic meanings. If you spend some time to exploring the ideas, you'll soon find the right vibe which suits your personality and create an event of your lifetime. You can start with one of major moments or items - the wedding vow or bridals bouquet - and develop a major theme with numerous tiny details to express your sense of humor or emphasize the importance of this particular day. At nautical weddings use a lot of white and blue colors with a pinch of gold, yellow, orange or brown. Or you can start start with a huge list of ideas, related to the chosen theme (nautical in our case) and than carefully select what you feel could work for you, what is out of question, and what might work, but needs some fine tuning. The final result will be unique creation reflecting personalities of the newlyweds. It doesn't matter what will dominate, mystical seahorses or colorful maritime flags, optimistic lighthouses or simple white and blue striped motifs, your wedding is your job, your responsibility and of course your joy. Invitation represents so much more than a simple piece of paper with necessary information, we have to be extremely careful to follow the written and unwritten rules of the etiquette. Invitations, save-the-date cards, RSVP, thank you notes, ... It's easy to make a mistake, but with this comprehensive and to the point guide everything will run much more smoothly. Use the power of knowledge of professionals and make the most of your W-day. Jennifer Cegielski knows everything about classic and contemporary wedding stationary and with this book you can profit from her huge experience. She takes you from sometimes overwhelming process of inviting hundreds of guests step by step without fear to make unnecessary mistakes. So if you start planning the wedding with her book, you are already on the right path. Did you know, for instance, there are specific rules for writing for each level of formality? Ultra formal and formal can differ from casual like day and night. Avoid any possible embarrassment by this superb guide through sometimes unpredictable waves of wedding stationary etiquette! How about the technical part? Do you know enough about types of paper, inks, formats and so on and on? With this book you'll become an expert in no time. Addresses on envelopes should be written by hand. If for some reason you can't write them or hire somebody else to do that instead of you, there is printing software to help you address the envelops in functional and aesthetic way. Always use full names and addresses. Apart from obvious practical reason to avoid misunderstandings, it is also a way to be polite and respectful at the same time. There are also few exceptions from this rule, where abbreviations could be used, but this is beyond the goals of this article, so in general - write names and titles in full, including middle names. Wedding invitations are traditionally sent in two envelopes. The outer is fully addressed to the invitee or invitees (Mr. and Mrs. John Smith + full address) and the inner, which is never sealed, the last names only ( Mr. and Mrs. Smith without address, but with the option to add children's names, if necessary). When addressing unmarried couple, living at the same address, you can use the same envelope, but their names should be written separately in alphabetic order. When we address children, they should be ordered by their birth date, older first. If we invite a single person, we can include 'Please, bring a guest' on the inner envelope or send separate invitation, depending on specific situation. If we don't want children or somebody else to be present at the wedding, and this is maybe not clear to the invitee, explain that personally or by phone, not in the official invitation. Never ever, mention wedding repository, if any exists, on official invitation. Spread the word in other ways. By mouth is traditional, through your wedding site is more contemporary (and, by the way, this may be mentioned on your stationary). One great idea can initiate a whole avalanche of events leading to the most unique wedding experience. Watch some of these astonishing creations with algae and shells and let your creative juices flow. Remember: everything related with the see can be used, you are by no means limited with white and blue, because the ocean hides many treasures of all possible colors. Just keep in mind these two most classic wedding colors should dominate the general appearance. Elegant and classy feeling achieved with combination of white and blue can be refreshed with carefully chosen details in more energetic colors (red, yellow, orange and brown). The most popular accent is gold. Think about ribbons on centerpieces, representing sun rays or berries in bouquets, which add life to peaceful, yet always lively sea life. What is your favorite element in nautical themed wedding? You are right, CruiseReady, the wedding etiquette can be pretty confusing. Thank you for your comment! Those tips about invitations are really useful for a newly engaged couple. So many people don't know about all the proper rules for things like this!